Welcome to Thinking Out Loud Thursday! So glad you joined me and Vanessa from X-tremely V for some thinking out loud today! Today I'm thinking out loud about some random thoughts I have swimming around in my head. First ~ I want to wish my wonderful daughter-in-law, Kayla, a happy 25th birthday! She has been a true blessing to us and I'm so excited to have her in our family. Kayla and Ian started dating at the end of their senior year in high school. I remember telling a friend that I really hoped this girlfriend would be "the one", but I was afraid that the timing was off. Not many people who are dating in high school make it all the way through college. Thank heavens Kayla and Ian did! I'm SO happy they are married and couldn't be prouder of my daughter-in-law. Ian did an excellent job choosing a wife. Happy birthday, Kayla! Speaking of choosing wisely, what did you think of JoJo's pick? 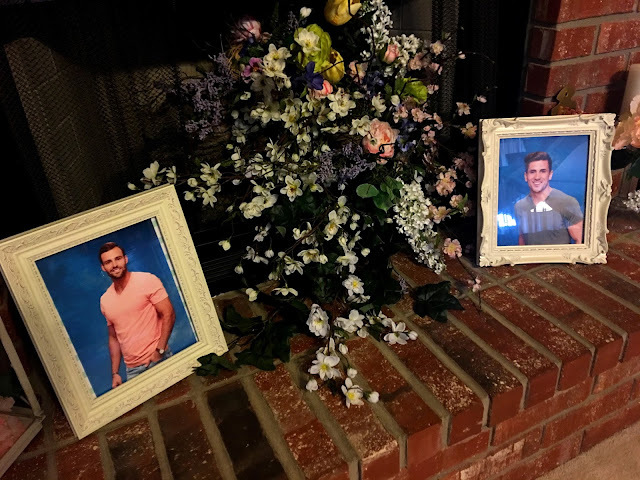 I had a little viewing party at my house Monday night and frankly, many of us found the episode to be a bit boring. Thank goodness we had all kinds of catty comments flying around to keep us laughing. Chris Harrison welcomed the guests at the door. Well, not the REAL Chris Harrison, but an image of him. There is a little picture frame in our guest bathroom that is always displaying a picture for the occasion. When we're celebrating a birthday, I try to have a picture of the honoree in the frame, holidays have special little prints ~ you get the picture (pun intended). Monday night JoJo was featured in the frame. Just in case we needed to reference what Robby and Jordan looked like, I printed pictures of them and had them framed on the fireplace. For dessert, cupcakes were on the menu. I loved the way the cupcake toppers turned out. I just grabbed a picture from the internet (not hard to find) and cut out circles of Robby and Jordan's heads. Glued the circles on a little bit bigger circle and stuck it on a flat toothpick. So easy and quick! Now we're on to Bachelor in Paradise. I just can't move away from the madness! Are you watching that train wreck show?!? For me, these are great shows to get together with friends and let the comments fly. Now it's your turn. What are you thinking out loud about today? Link up your favorite post(s) and let us know. Your viewing party was perfection!!! Love it! I'm sucked in to Bachelor in Paradise too!!! It's like a train wreck - you can't help but watch! Not a Bachelor fan but as always you make fun out of the ordinary. I always watch bach/bachelorette/bip and honestly this season she dropped the L word to Jordan on more than one occasion, which gave it away. As for his family issues, well JoJo, it happens and well you just may not meet the famous brother you want to meet. Fun little party you had! I don't really watch it but I love the idea! Those cupcakes are great! What a blessing to have a sweet daughter in law! 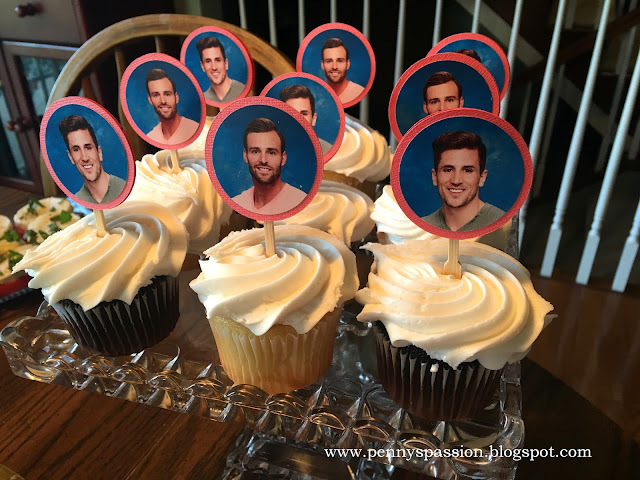 Your Bachelorette viewing party looks like so much fun! Love that you are so close to your daughter in law! Thanks for hosting! OMG... your viewing party is the cutest one I've ever seen!! 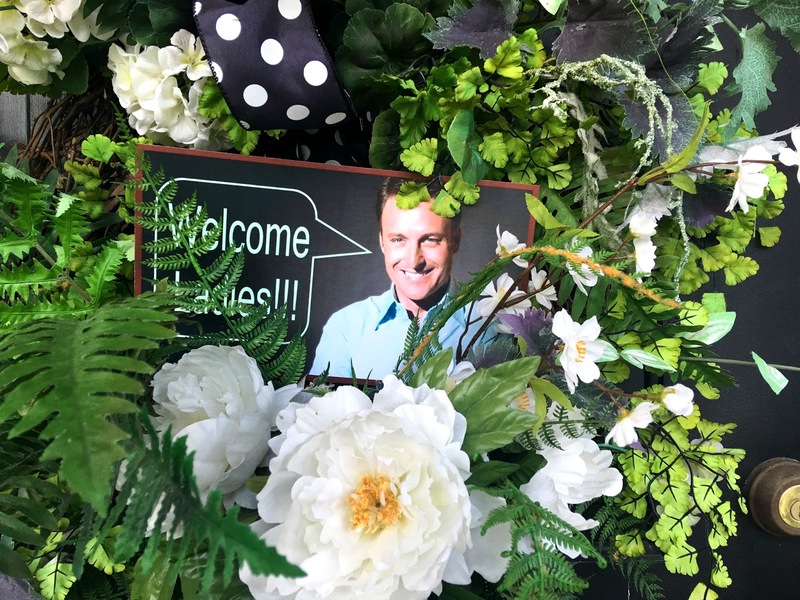 My favorite is the pic of the host in the bushes!! Have a great week!